Once in a life time opportunity to be an honest climate modeller — research scholarships! Most critics of anthropogenic global warming, and there are many, never get the opportunity to actually have a go at contributing to climate science in a practical or tangible and constructive way. That is, they never get to pull a lever, press a button, build a model or make a forecast. At best they might throw rotten tomatoes by way of blog posts and comments. This is because the tools of modern climate science are very complex and generally run on super computers with restricted access. But what if it was possible to build your own climate model on a gaming computer, with some help from artificial neural network (ANN) technology? Artificial neural networks are a form of artificial intelligence and machine learning, that can be applied were there is an abundance of data with patterns and/or signals embedded in that data. Artificial neural networks have application when there are problems or questions to be answered, but the relationships can’t be easily reduced to simple formula. Artificial neural networks (ANNs) are a key technology in Big Data already used in many financial, medical, commercial and scientific applications. IBM researchers have so much confidence in the future of the technology that they are designing a chip that’s fundamentally different to the type of computer chip currently used in computing, one that will be more compatible with computers that run ANNs. John Abbot, a Professor at Central Queensland University, has 10 years experience working with ANNs, initially for share trading. So successful, he once bought himself a Chevrolet corvette on the earnings from a few days of trade. Unfortunately the Corvette was parked in a garage beside the Brisbane River at the time of the catastrophic 2011 flood. John could have become depressed about the loss of his little red car, but instead worked with Jennifer Marohasy to see if it might have been possible to forecast that flood event using relevant climate indices and ANNs. Jennifer and John have since published several peer-reviewed papers on the application of ANN to rainfall forecasting in Queensland Australia. These preliminary investigations suggest that prototype ANNs, mining historical climate data, run on gaming computers, are more skilful at medium-term rainfall forecasts than the most advanced general circulation models run on supercomputers. The B. Macfie Family Foundation funded this initial research and is now providing money for three scholarships for research higher degree candidates to expand this program of work. Successful applicants will each be provided with a tax-exempt living allowance scholarship for a fixed term of up to 3.5 years, with a commencing stipend of $32,000 per annum. They will also get their own gaming computer and ANN software to play with. John will be the Principal Supervisor for these projects. He has a BSc from Imperial College, London, a PhD from McGill University, Montreal, and over 110 publications in scientific and law journals. While at the University of Tasmania, John successfully supervised to completion nine PhDs and nine Honours students, resulting in more than 50 co-authored publications. Applicants must be Australian or New Zealand citizens, or Australian permanent residents, and graduates from a science or engineering discipline. It is expected that applicants will like problem-solving and playing with numbers. Applicants will not be discriminated against if they already have a lot of life experience, and are sceptical of anthropogenic global warming. There is more information at the Central Queensland University website. 74 comments to Once in a life time opportunity to be an honest climate modeller — research scholarships! Finally, people might get some truth in the science…hopefully. The 2011 flood was man made, also nearly 1.5M below the 1974 flood line. I have the ’74 flood line plaque on my garage door jamb and shot the levels with my laser. the maritime museum in sth brisbane has the levels marked on the pump room wall next to the diamantina – similar to 1911, 1974 and 2011. It looks like the alarmists are getting frantic trying to rationalise the demise of their relition! ‘Tactical mistakes’ as in being outright wrong. Admitting to being outright wrong is not an option for the climate faithful, as most have wives and children to feed and clothe. After all, what other government would employ a climate scientist who was so politically correct as to tell the truth? As for the private sector, they want real scientists and there the job description of ‘climate scientist’ simply does not cut it. And so, the big lie has to continue. ‘Honest climate modeller’; now there is an oxymoron if I ever saw one. However, it is a nice idea to see if some could be created. The concept is rather like developing a new vaccine, I am sure that is something we all feel we could support. Whoops, it should read politically incorrect. Thanks for the link to that rabbit hole of thought…….. Funny did you notice how many comments were deleted? ***perhaps they were testifying as recommended by Marshall! Recently I learned about “Prius repellent” — a tricked-out truck takes deep swigs of diesel and spews black smog all over a tailing vehicle, preferably a hybrid. These ominous clouds signal that, in our national conversation about climate change, something has gone very wrong. In his view, the “Green Team” should borrow several elements from the “God Squad”: There should be opportunities for public commitment to the cause. anything that might help to replace these researchers would be welcome. Er, what’s this new game console with the pompous name: Artificial neural networks (ANN)? How ANN works: given the wanted out, “learn” it from arbitrary input, rinse, repeat. So, what’s the output you want? If you understand logic, ANN output is a premise and not a conclusion. In particular, nobody is able to discern unknown output from false output. Jo, The link in the first line goes to CQU, but returns a “page not found” on their web site. You don’t even need neural networks, just add the PDO and a 10-20 year delay in effects from the sun. So easy a child could understand it. Prediction? Temperatures wont warm much until at least 2030, and might even cool. > At best they might throw rotten tomatoes by way of blog posts and comments. That’s an all to accurate description of you lot; I’m astonished JM is honest enough to write it. But she’s right: its all throwing ignorant rotten tomatoes, nothing constructive. > and generally run on super computers with restricted access. Rather less true. Its possible to run climate models on perfectly normal home-type PC hardware. You report this as “weather and climate”, and indeed that’s the proposed PhD title. But I’m dubious that this approach is usable for 100-y timescales. And the text of the proposal is “medium-term rainfall forecasting” suggests they aren’t thinking beyond seasonal scales. So I wouldn’t get too excited if I were you. They said HONEST.. why are you on this thread ????? From a farmer’s point of view, research into accurate “seasonal scale” forecasts is much more exciting (and valuable) than climate research into “100-y timescales”. Not only is it more exciting and valuable it would actually be USEFUL for everybody who needs to work with the weather/climate year in and year out. It’s not only us farmers. . .we can add such varied enterprises as mining, transport & logistics, construction, tourism etc etc etc & therefore of course all the other industries and services that are either directly affected by or directly service/supply those various enterprises. Not only that. . .if much better skill was happening in seasonal forecasting, it would be far more likely the 100 year timescales are skilful. Artificial Neural Networks (ANNs) are about the most advanced of the statistical modelling tools currently available. They are used in all sorts of areas were forecasts are dependent on historical data… but so far not to any great extent in weather and climate forecasting. ANNs, like all forms of machine learning, rely on their being patterns in the data and data available. Of course, most sceptics believe there are natural climate cycles that affect weather and climate. What John Abbot and I are doing, is feeding information into an ANN that we hope contains enough information about the cycle that the ANN can build a model that can then be used to develop a rainfall forecast. So far, our method shows promise. We have so far limited our work to using recognised climate indices (e.g. SOI) and local climatic variables (e.g. local maximum temperature) to generate forecasts up to 9 months in advance. But we believe there is so much more that can be done. This work has a practical utility, and also a theoretical relevance. Indeed if our ANN models can generate much better forecasts than the very best GCMs then this would suggest that climate is not on a new trajectory; that natural climate cycles still dominate. Furthermore, its possible to input carbon dioxide as a variable. Just be careful not to feed it any Giss or HadCrut. because most non-sceptics would also agree. May I ask what data sources you will use, BOM I would expect? Most sceptics know that natural climate cycles the overwhelming influence on weather and climate. Most “believers” are gradually being forced, by reality, to realise that sceptics have been correct all along. Even brain-washed donkeys may eventually figure it out, but its going too take a while. I wouldn’t be overly reliant on BOM temperature data, unless you can find un-adulterated versions. Ken from Ken’s Kingdom may be able to give a pointer as to where to find such rare items. BOM rainfall data is probably rather more reliable, but oddly, has big gaps in the last decade or so in many places. It will, to a large extent, be up to the scholars to decide what data they input. In previous publications I have sourced data series for the inter-decadal pacific oscillation (IPO) directly from Chris Folland at the Met Office in the UK, temperature series have been constructed from ‘raw’ BOM data (not ACORN-SAT), the Dutch Met Institute (KNMI) has been the source of many indices. I’m keen to find students interested in developing their own climate indices, and perhaps one day, extraterrestrial indices. On the contrary, alarmists generally believe that natural climate cycles stopped around 1950. Any comments about the impact of natural climate cycles after that year are usually treated by the alarmist collective as the worst form of heresy. So, supposed man made influences on climate can be measured to the fifth decimal place, while natural climate cycles now have zero impact. Neural Networks have a very chequered history w/r to creating forecast models. A hilarious story from the US Army, they tried to train a neural network to spot whether an aerial photo contained a tank – to help flag photos which showed military hardware. The thing worked perfectly during testing, then failed completely on its first field trial. Upon investigation, the researchers discovered that every training photo which contained a tank had been created on a cloudy day – and the training photos which did not contain a tank were mostly taken on sunny days. So the network was really good at spotting the difference between cloudy days and sunny days. The army saved some face though from this debacle – they sold the neural network to the Airforce, who used it for monitoring weather conditions. Yep, it is amazing how a petrol tanker can look a lot like a Scud missile to a Neural Network. But they are good at learning. Just don’t put fins on your petrol tanker, even if they do look totally awesome. Jennifer, it doesn’t matter that IBM put their software simulation on a chip, if you study what Alan Turing’s work has produced. Above all the following critics remains the same: IBM’s claim is a HOAX. Have you seen the blueprint of the IBM chip intentionally contains no learning function? There has been a lot of progress since the work of Alan Turing. But I’m not suggesting that IBM can build a computer that thinks like a person… as your link suggests. But I’ve noted that IBM believe that with a different sort of chip they can produce a computer that is even better at dealing with Big Data. In particular for pattern recognition… and this, I believe, is where the big break throughs might come in weather and climate forecasting. > but so far not to any great extent in weather and climate forecasting. > This really is something new. But your statement in the PhD prospectus that “this technology has not been used for operational weather forecasting” does rather overstate the novelty of your approach, given the numerous papers (e.g. http://www.mssanz.org.au/modsim2011/I5/mekanik.pdf, http://www.nssl.noaa.gov/users/brooks/public_html/papers/hallbrooksdoswell.pdf) that do apply it to research weather forecasting. Why are you spending so much time here? Is it because you have been banned from Wikipedia – a major feat in itself – for the huge amount of misleading BS you have posted there? Someone with the equivalent reputation of Joseph Goebbels is not going to get much traction with those, like most of us, who have a built in BSometer. It is just one of the characteristics of being a sceptic. Are you suggesting this is the sort of place people wouldn’t want to visit? That would be really rather rude to our hostess, so I hope now. Unfortunately, trolls – yes, as well. Trolls are tedious individuals, blinded by their own self-perceived brilliance and/or a rabid desire to share their ‘enlightenment’ with others; the big problem they have is that no one else shares their views, at least not in the real world. And yes, your comments are as tedious as they are smug. Anyone – not a troll – disagree? WC: which is careless, and wrong. So go on William, tell me where there are three privately funded scholarships available for skeptical climate modelers for higher degrees. Oh, sorry, I assumed your “something new” applied to the science involved. New opportunity, and absolute latest ANN technology applied in NEW ways to answer new questions… including, potentially the influence of extraterrestrial forces on climate and weather here on earth. If http://www.sciencedirect.com/science/article/pii/S0169809513003141 is the kind of thing you’d be doing, I wouldn’t be interested. ~monthly regional forecasts from lagged indices is dull, IMHO, although I’m sure it has commercial value. Do you have a publ list for JA? Googling didn’t throw one up, which is odd: I thought most people has pub lists on the wub by now. Indeed, since 2010, that one was the only non-mangrove paper I could find. Scepticism is something new, surely. Of course it’s wrong and of course it’s nothing new. Climate scientists continually prove that CO2 is not a factor when the models continually fail to refelct actual observations. If you want to compare ANN processes forecasts to natural lunar tidal cyclic pattern forecasts, I have maps posted until November 4th 2015, for North America, and Australia. What I am very interested in, is how to input “natural lunar tidal cyclic patterns”. What are the data series we should use? I would then consider the skill of my forecast, to determine the value of this input. From the viewpoint of Australian weather The lunar declinational angle period of 27.32 days would be the place to start, due to the quadrupole nature of the global circulation in the SH, I would look at the 109.28 day long period of the return to most similar jet stream repeating patterns. The dew point data base, as far as I know has been left raw and unadjusted, and would be as good as the precipitation data (with better coverage as it is read every day, where precipitation is full of gaps in dry spells) so it will give a better showing of the specific heat of the air on a daily basis to start with, and would be better to Gage growing conditions than just air temperature alone. The output of the wind generation sites in Oz show a periodic cyclic pattern due to the ebb and flow of the wind patterns with the declinational tides in the atmosphere, on the 109.28 day period quite strongly, and it would be interesting to provide a forecast of the probable output of the systems as they are not going away soon. The stability of the grid could be enhanced with a good forecast of expected output. Wind speed and direction should show a good correlation with dew point changes, especially in coastal areas. Richard, thanks for your interest and quick reply. A real limitation of ANNs is data. They need long series of high quality data. We are interested in rainfall forecasts, so this is our output… we would be unlikely to ever substitute this for dew point. I am interested that your wrote… “I would look at the 109.28 day long period of the return to most similar jet stream repeating patterns”. Is this available as a data series. This might seem like a silly question… but we need/ANNs need data series. At the moment all our forecasts and series are set up on a monthly basis. The weather forecast method I use, is done by setting up tables, one file for each date, all Precipitation data from all stations reporting for that date are put into one file.long/lat/ data value. One table for each parameter (Highs for the day, lows, precip, snow, snow on ground… Then I pull the data file for four different dates each 6558 days apart, make a grid with a resolution of 3 mile squares, combine the grids by averaging, then present the composite, as the maps seen on my site. When there are breaks in data from any stations they are just not figured into the final composite. The temperature contour maps are drawn with one degree F spacings, minimum smoothing by using only the 8 nearest neighbors, which for the USA the median distance for the 50%tile station spacing nearest neighbor is about 15 miles. The denser the raw data the finer the resolution of the finished maps. Which is why I would look at dew point data, and correlate it to the precipitation data, to give better definition to the precipitation data contours. I am currently out of saving to spend on developing more coverage for dew point information, or adding other countries at this time, so my future input to output of maps is mostly over at this point, but I would encourage you to find a way to get the extra info from dew points into the precipitation forecast method. The Australian dew point data that I have is recorded either four times a day, or hourly depending on station and/or reporting year changes in method, and was more than the developer I could afford to hire was willing to deal with, the single daily entry data sets was all he was willing to process. If I had good funding resources there are things I would do differently, and overlaying dew point and rainfall would be the first, plotting hail information from crop damage claims would be the next to add to my portfolio of maps, as the information is really well documented and data dense to multiple long/lats per section of land in many cases, with total claims for the most severe days outbreaks in the tens of thousand per state. The uplifting with little horizontal wind shear most common form of hail production is most enhanced right at declinational culmination for a three or four day period, and is usually proceeded and followed by tornado production that uses the wind shear to develop with the cyclonic movement needed for their production. So the optimal composite of a hail tornado overlay would be most help full. With each lunar declination cycle from Maximum North to the next, there is a fairly set pattern of global jet stream flow that shifts through four different patterns through the 109.28 day four fold cyclic pattern period, this is more obvious in the SH, due to the less complicated topography, (less mountain obstructions) = smoother flows. I have looked at global frontal maps in building 54 M.I.T. campus going back to the 1800′s and find that the four fold patterns are consistent in their modes of repetition, and in synch with the lunar declinational period of 27.32 days, the whole four fold pattern of progression takes 109.28 days to move around the world and arrive back to the same ocean basin it oscillates in. It is to keep this pattern in synch that I use one less declination 27.32 cycle than the Saros cycle of (241 declinational periods) 6585.32 days in length to arrive at the (240 declinational periods) 6558 day long pattern I find most help full in my forecast method. It is not a data base, only a periodicity used to keep the pattern recognition synchronized to useful repeatability. This a sample of the type of animated movies I am working on making at present to show the repeating patterns and cyclic characteristics of global circulation. I think I have what you want. During the last couple of years I have had a hobby working with climate data that has been based on an ANN that I constructed myself. First I looked at the global temperature anomaly and compared that to various climate data as inputs. My interest then quickly turned to ENSO and I looked if it was possible to find correlations to ENSO and to make ENSO forecasts. After working with this problem for a long time I can now say that I have solved what underlining forces and mechanisms there are that are causing variations in ENSO and I can now make long term ENSO forecasts. This is based on a combination of tidal and electromagnetic solar forcing effects. I know this is a bold statement, but I am very confident that this is the case. Because I’m not working in academia, but as an independent researcher on my own and I achieved these results, I’m now looking for ways to make my result public while at the same time make an impact on this field. One reason is that I think that a substantial part of the connection between temperature swings and the sun that is occurring with its 60 years sinusoidal periodicity could be partly attributed to a solar driven ENSO effect rather than by the GCR theory as suggested by Svensmark, which is favored by many skeptics. In other words, in my view the notion that human activity has been a dominant force of recent climate change as suggested by IPCC now becomes over more bizzare. I can send you a data file I have produced which includes the monthly tidal forcing vector value and the vector angle value relative to the equator. This is data that has been sub optimized by me which gives futher improvement to my ENSO predictions. This file should be simple for you to include into your ANN for your precipitation predictions. If you use this file then I’m interested if you get data that corroborate to my current work, i.e. you get improvements in your predictions by implementing this data. If that is the case I want to know how much! Just ask and I’ll send you this file. One Will says weather is now climate. Which Will will fail the “Once in a life time opportunity to be an honest climate modeller — research scholarship? The one that doesn’t forget to feed his cat? Global relative humidity has been declining since 1948. So how does this decline make sense when we should have seen a rise due to rapid increases in co2? 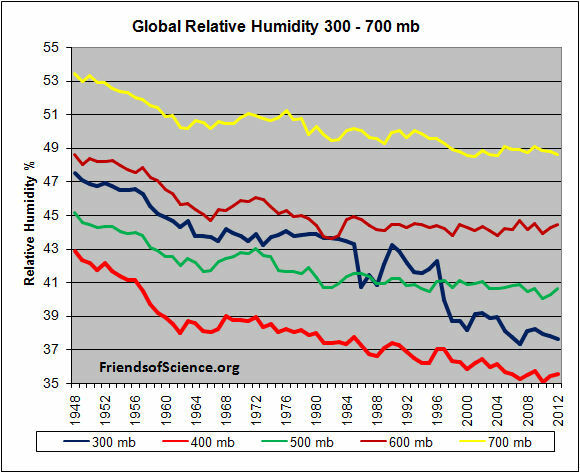 And here is the link to the graph for relative humidity over the last 60+ years at different levels. Figure 5. Global relative humidity, middle and upper atmosphere, from radiosonde data, NOAA Earth System Research Laboratory. Mark that F for Fail. No research scholarship for you! Your one of best of the 97% consensus of settled climate science that lot can send! It is sad that this even needs to be said. I agree. It confirms what many of us already know about the real world of today – experience and wisdom that comes with age are considered a handicap by most employers. It’s no wonder the world is self destructing. How strange to see the words “honest” and “climate scientist” in the same sentence ! The problem with neural networks, as opposed to something like a production rule approach, is that they’re not scrutible. They can give you a result but no explanation of how they reached that result. Essentially, they just tell you the answer is 42. It’s up to you to work out why that’s the answer. Who’d make big bets on a prediction the rationale for which is opaque? 20 years ago, NNs were going to revolutionise AI but after all the enthusiasm died down, it was found they were only of utility in very small problem domains. Just like with climate models, if we don’t know how something works, handing the problem off to a computer and expecting it to work it out for us is extremely silly. Your comment about ANN not giving you “an explanation of how they reached that result” suggests you have no idea what you are talking about. I have a computer running an ANN model in front of me now and the breakdown in terms of utility of input data, and various derivatives of that input data is so detailed. Jennifer, having designed multi-layer NN over a couple of decades ago and experienced that same euphoria that we’d found the silver bullet that could cure all ills, I recognise the same affliction in a newer generation. Scrutibility is actually quite simple. The NN comes up with a suggestion like rebalance the portfolio by a few billion dollars in favour of T-bills. The fund manager quite naturally wants to know why it’s offering that advice. Apart from showing him your training/annealing runs, you don’t have an answer for him. That fact that you didn’t address the rather simple point I made in any coherant, never mind polite manner suggests to me that situation still pertains. But I’m sure you’re sure you know better. I support the technical part of this comment. I have studied tho’ not personally designed, NN models. They may have a use when you want an answer to an urgent problem and have no clue as to the relationships, but getting understanding from them is tricky. So, on this occasion I am with William Connolley and not getting too excited. The way I read the recent approach used by David Evans is that it is a kind of search for patterns which has more chance of providing understanding. If it were my money I would give that approach a grant rather than NN. I’m also using it intelligently and can tell you there is a lot of opportunity for exploring output, and how that output was generated by the model. why am I not surprised that gigs for honest climate scientists pay far less than those for regular climate scientists? The oil industry uses neural networks to guide dynamic model tuning. In other words, we still use classical model principles, but we allow the AI software to train itself using historical data to tune the models. The AI also generates alternate tuning solutions, which are then used to project a set of forecasts. As you probably know, having a tuned model doesn´t mean it´s right. So we use raw computer power to generate a multitude of runs, and then we just compute statistics to take a wild guess at possible outcomes. Contrary to what seems to be used in Climate Models, we use a single basic model with a single initial set of fluid behavior equations of state. I´ve been advocating we also allow the AI to alter the equations of state within reason. In our case the AI can also guide the geostatistical realization in backwards mode, allowing the dynamic model to alter the landscape so that it gets better match results. I don´t think this is an issue with GCMs, because they are too coarse, so they don´t have much of a landscape they can alter, right? With apologies to all who enjoy The Hitchhiker’s Guide to the Galaxy series by Douglas Adams for my obviously poor pastiche. The Total Hypothetical Vortex Hub™ (henceforth the ‘THVH©’) is a device built for the UN-IPCC as the ultimate climate modeling system. It was made by linking all super-computers worldwide to a special super-hub that runs the Climate Hypothetical Paradigm Program©. The original Hypothetical Paradigm Program© was written in Hansen Expandable Lapse Language (HELL)™©, but has recently been upgraded with ‘Green Maggot®’ modules written in Inflatable AR5E™© and supplied by Mann-soft© Litigation of America®©™. This fantastically powerful system can model all climate scenarios as a mere sequence of static assemblages of weather patterns with total 100% confidence (±3% max. stnd. error) in projected predictability. The operational basis is built on the simple idea that below the stratosphere, every chaotic little breeze on the planet is affected by every other chaotic breeze. These breezes make winds, gales and storms that we experience but more importantly this controls all precipitation, and so temperature of the planet. And this is well understood by oridinary climatologists. Also well understood in chaos theory is that a butterfly’s wing movement in Brazil could theoretically cause the breeze that starts a cyclone in Africa. To stop this unwanted chaotically random element, the UN initiated a massive cull of butterflies, except one. This single butterfly powered (the original) ‘THVH©’, and by careful analysis of it’s wing movements, all model climatic scenarios and eventualities can be reconstructed. These reconstructed outcomes are maintained on the ground, by the use of the UN mandated massive global wind-farms arrays. Thus all weather and climate is reduced to easy predictability. The ‘Green Maggot®’ upgrades dispense with this last butterfly by modeling its movements using ‘indiscrete structured elements’ from the original Hansen Expandable Lapse Language (HELL)™©. The Total Perspective Vortex (aka ‘the TPV’) is a device built to display a practical application of the theory of holistic atomic interactivity. An idea that if every atom of the universe is affected by every other atom of the universe, then it is theoretically possible to extrapolate a model of the entire universe using a single piece of matter as a starting point. The TPV does this using a very appetizing piece of fairy cake as its extrapolation base. Trin Tragula originally created the TPV as a way to get back at his wife (who kept telling him to get a “sense of proportion”). The TPV is now used by the UN as a torture method for ‘CAGW climate deniers’(see Encyclopedia Galactica reference Lennart Bengtsson). The prospective victim of the TPV is placed within a small chamber wherein displayed is a four-dimensional model of the entire universe — together with a microscopic two-dimensional dot bearing the legend “you are here”. The sense of perspective thereby conveyed destroys the victim’s mind. In contrast to the TPV, the Total Hypothetical Vortex Hub™ in running the Climate Hypothetical Paradigm Program©, and with the additional UN mandated add-on modules, has ensured the rapid decline of civilizations. The UN’s first successful deployment was on the planet Earth were 7 billion humans died as direct and indirect results of enabling the ‘THVH©’. Ironic that the HGG post was the 42nd entry on this thread as comment #21. That is the holistic nature of comments. There’s a big sigh on my side of the screen. It’s an opportunity at which I’d have grasped 20 years ago. I wish Jennifer all the luck in the world to get the people necessary to develop neural networks for useful climate models. I also hope that “Once in a Life Time Opportunity to be an Honest Climate Modeller” isn’t going to be such: That there will indeed be an increasing trend of opportunities for honest climate modelling. Nevertheless, those who lay the first paving stones are the ones who set the general direction of the path. Any of you Aussies going to see Lady Gaga whilst she’s playing there? What a novel idea, actually contribute something. But skeptics have contributed for years. They have just been ignored, ridiculed and sometimes threatened. The possibility of honest climate modeling is interesting and compelling too. David Evans went for a different approach to that problem and I hope the flaw he missed has some resolution and he can finish the work he started. But on the other hand, it will still be just models until they prove to be able to predict the future climate. I wish Jennifer good luck in the endeavour she’s undertaken. Remarkable. They’re not looking for people who are naive, malleable, & compliant. I suggest that it is very difficult to impossible to find a correct solution if you do not understand the problem. It gets worse. If you don’t understand the problem you won’t be able to know you have found the correct solution. This even if you accidentally found the correct solution among the countless trillions of wrong solutions. Hence, you are much better off working to understand the problem rather than testing prospective solutions. You might even have a chance to find the correct solution and actually know that you have found it. Within the above is why the alarmists have failed so miserably to predict the future. They assumed a solution (man made CO2 as the primary driver) and looked only for evidence that supported their preconceived solution. Very little effort was spent on understanding the earth’s climate system in the context of the earth, sun, solar system, and galactic interactions. They simply assumed they were negligible. Hence, their predictions are increasingly failing to match reality. Their precious consensus not withstanding. If I didn’t already know you are a software engineer, Lionell, that statement would tell me. Understanding the problem is everything. I recommend selecting candidates who have the capacity to extend the methods to deal with any algorithm deficiencies in the spatial dimensions. I recommend promptly dismissing anyone sales-pitching that climate’s a time-only problem. Climate is multivariate & spatiotemporal. In order for the investment to be worthwhile, the candidates need a solid foundation in multivariate spatiotemporal aggregation criteria. No ANN can compensate for bad human judgement about multivariate spatiotemporal aggregation. I think it will be very tricky not wasting this investment. Better do it right — otherwise prospects for skeptic funding in the future will be diminished …and skeptics will remember why. I wish the team efficiency & penetrating insight …and multivariate spatiotemporal common sense!! Using an ANN is simply trying to apply a prospective solution to a problem that is not understood. It will find something but you won’t know the what it found nor how it found it. You will be unable to make use of the result with any useful level of understanding. You would be better off flipping a coin. You know that it gives the right answer roughly 50% of the time. The ANN approach will give the right answer once in trillions of times. In either case, you won’t know when the answer is right but a coin gives answers more quickly and at a far lower cost. The results will be equally useless. Remember, the ANN does not have any ability to understand and evaluate the quality of what it does. It simply acts as designed on data that it is given. It gives the results it gives and adds no value to the end product. In the final analysis, it is nothing but a machine based multiple non linear regression analysis. The result of which apply only to the data it is given. The interesting thing is it will find something within a totally random data set of sufficient size and degrees of freedom. That something will itself be random and therefor meaningless. There may be circumstances where NN can be useful. That would be when there is much good data. Certainly there is much data, but looking at Jo’s post yesterday ‘Cooling turns to warming’ as well as many other places leads to the conclusion that sifting data for authenticity is a major exercise. Let’s hope Marohasy has an approach.